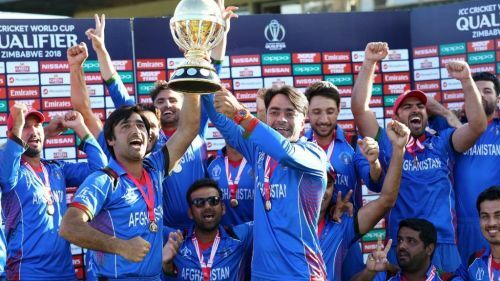 One of the most improved team in the past two years, Afghanistan has moved through the ranks to emerge out from the shadows of an associate nation. Their performance, especially in the limited overs format, have done a whole lot of good to their cricket. It was mainly due to their exploits in the white-ball format which helped them earn Test status earlier this year. However, they are still too far to be a formidable Test playing nation but the seed was sown when they played in whites for the first time against India in June 2018. The team has already witnessed a great run in recent time with superstars such as Rashid Khan, Mohammad Nabi, and Mohammad Shahzad, who are a source of inspiration for the budding cricketers back home in Afghanistan. The Asghar Afghan-led team will be playing their second World Cup next year in England. It was a hard-fought spot earned after they won the finals of the ICC World Cup Qualifiers, to pip the favourites West Indies in the tournament. With such a strong lineup, Afghanistan is the side to watch out for in the tournament next year. It hasn't been a great sight for the 1996 World Cup winners in the past two years or so. Ever since the retirement of the legends from their game, Sri Lanka has failed to find players who can stand up to fill in their shoes. The World Cup in 2015 was the last time when Sri Lanka reached the knock-out stages of any multi-nation tournament. In their latest outing in the Asia cup, the Islanders bowed out in the first half of the tournament. It is disappointing to see Sri Lankan cricket going through such a turmoil wherein even if the seniors step up, the team is unable to perform as a group. With such a situation, one would bet on Afghanistan to get the better of Sri Lanka on nine out of ten times. The Afghans got past the Lankans even in the Asia Cup to progress to the Super-4. It will take some task for Sri Lanka if they think to beat Afghans when they meet next year in the important clash at the World Cup 2019.